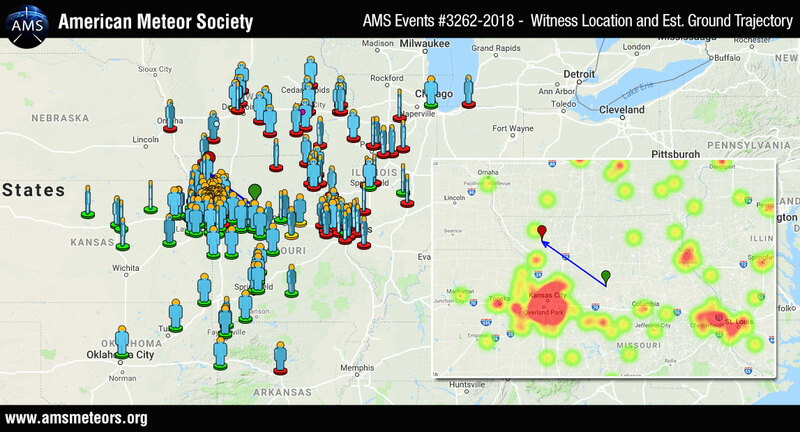 The AMS has received over 500 reports so far about of a fireball event seen above Missouri on August 27th, 2018 around 8:40pm CDT (August 28th 01:40 Universal Time). The fireball was seen primarily from Missouri but was also seen from Kansas, Oklahoma, Arkansas, Illinois, Iowa, Indiana and Nebraska. 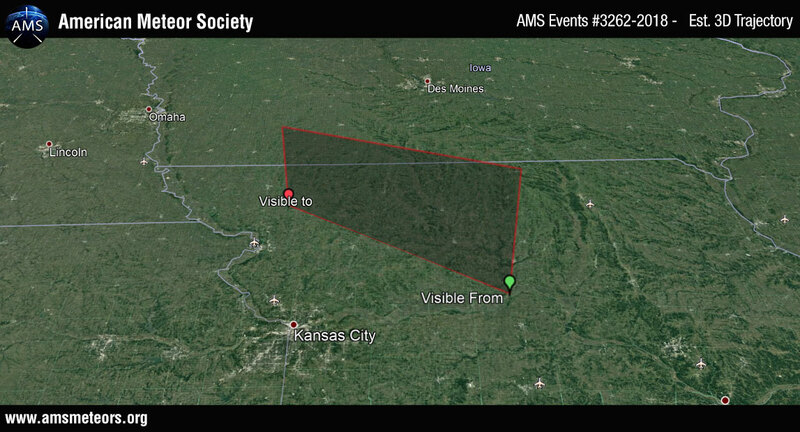 The event has been caught on an AMS Camera operated by Dana &s; Keith Jenkerson from South of Kansas city. As you can see below, the velocity of the object was pretty low and we can clearly see a fragmentation (which means that despite its shallow angle, the meteoroid actually went through the Earth atmosphere). I was on my Harley going north on Illinois 100. The great river road. I was just passing Lockhaven country club. It was the most beautiful thing I’ve seen. It seemed as if the tail of this reach from Missouri side of the river going west to east. To well past the river road. So close I felt I could reach up and touch it. I’m glad to see someone else saw this near me. I was heading west on Moro Road and could hardly believe what I was seeing. I was on Route 3 near Clifton Terrace and seen it. It was so cool when it started to break apart. It was so beautiful, and so close. I saw this fireball on August 27th 2018 at approximately 8:40pm from Springfield, IL. It happened im the western horizon, was very low om the horizon, and appeared to ne moving from south east to northwest actoss the sky. I saw it from Decatur as well at the same time, described the same way. It appeared to be moving a bit slower that what I have seen before, but looked amazing! I saw it at the same time same trajectory fom Bellevue Nebraska. It was low in the s.e. horizon and split up right before it burned up. So beautiful- saw this over downtown KC last night! This was so beautiful! I was on the phone with a friend (I in Appleton City MO and she in KCMO ) and we both saw this. It seemed so low in the sky, I am happy I witnessed this! Off subject but don’t see many people from Appleton city! That’s where my family is from! Also saw this from Violet hill AR. I saw it from Springfield MO. It was to the North and traveled roughly East to West, it broke up as it lost altitude. Largest fireball I’ve ever seen. I second that. We saw from Highlandville South of Springdield. Northern horizon relative to our position traveling Northeast to NorthWest (right to left) appearing perfectly lateral or perpendicular to our position. I seen this in Chester IL. It was bright.. It was fabulous! Walked out of Target at 151st & 69 in Overland Park, KS at 8:39pm About a 7 second duration & looking east, it moved across the lower 1/2 of the sky, SE to NW, before burning up & fragmented into 2 large pieces & several small which disappeared pretty fast. Extremely bright. Green & yellow. Didn’t see a smoke trail as it was pretty dark. It was the brightest one I have ever seen, for sure. My daughter and I were driving East on 151st towards 69, just passing the Target when we saw the meteor, also. Absolutely incredible and just as Brian described. What is a fireball? Is that anything like a meteor? A fireball is a term we use for a bright meteor. So basically it is still a meteor/shooting star, just larger and brighter than normal. I saw this in Shawnee KS. Very bright and broke into a few pieces. My wife and I were boating at Lake of the Ozarks when I saw a ball of fire coming straight at me. From the middle of the lake, lasted long enough for me turn off the boat and show my wife as it went past us and split into two pieces then burnt out. Amazing how big and close it seemed. Evidently it split and burned out as it entered the earths atmosphere. I wonder how large that is while on fire? A meteor the size of a softball can produce the light of the full for a instant before it disintegrates. This is due to the extreme velocity at which these objects strike the atmosphere. I have a feeling this object was larger than a softball, perhaps beach ball sized? I seen whatever it was as a stream of colors attached to a glow to the north of my location north of Bolivar Missouri. It was traveling low from southeast to northwest at or about 8:30 pm Monday evening. It was beautiful and I am just happy other people witnessed it. I saw this in Warrensburg, MO! It was incredible! I was outside with my camera, and got a shot of it as it went over my house from east to west/north west. It was beautiful, but my camera was set on night and I did not have time to change settings and so it turned out black and white….mine shows the long tail that reminded me of trailing stars;. I have a video of this event. i live in brashear. if anyone wants me to email it i can. My wife and I watched the whole thing. If you can, please send me your video of the meteor. I saw the fireball on August 27th 2018 at approximately 8:40 pm from Olathe, KS. We saw this in Overland Park, KS!!! I was driving north on Highway 13 just north of Branson West, MO when my wife pointed it out to me. At first I thought it was a medivac helicopter because it was so bright and lasted so long in the sky, but when it broke up at the end I knew we had witnessed something special. I’m also in Buffalo, and I ran outside, expecting to see a impact, it looked so close. I thought plane crash too. Viewed clearly in Claycomo, Missouri. Had no idea what I saw until reading this article. Thought at first maybe a “drone prank” with 2 orbs of whitish blue light turning red while it faded from sight heading NNW. I live in a small town Buffalo. And my Dad saw it that night. And thought it was a plane crashing. We were actually kind of waiting for something to come up on the News. Seen it from Clinton, AR while riding horseback at the Chuckwagon Races! I was traveling north on I49 near Fayetteville when I saw this. Spectacular site, especially when it fragmented! Saw it from westbound I-70 in Wentzville, MO. Thought it was helicopter landing at hospital. I saw this in Sullivan,IL traveling from southeast to northwest. It was beautiful and amazing! I didn’t know what it was but I’m glad to know it’s a normal occurrence and not some apocalyptic event. I saw this driving home from work on a country road with little streetlight pollution (between Nixa and Springfield MO). Glad I was looking up. look at cam 2, between 24-29 seconds all trees are moving due to object passing. I seen the fireball streaking across the sky my location was 19th and Hardesty Kansas City Missouri. I saw this driving home from work, I was driving north, a little north east of Asbury MO. About 8:40. Pretty awesome thing to witness. Saw it near Greenup, IL as my husband and I were cruising in our Jeep through the countryside. We weren’t sure what we were seeing at the time but it was really cool! I saw it in Des Moines, Iowa. Slightly above tree tops. I thought it was airplane landing lights until the fragment broke off and fell. PEOPLE IS POSSIBLE THAT I SEEN IT FROM FRANCE? I’M ON THE SOUTH WEST ON THE COAST. I WAS GOOGLEING FOR THE SIGHTING IN FRACE AND I FOUND THE SIGHTING IN UNITED STATES. No, it is not possible for the same fireball to be visible so far apart. The limit is around 500 miles or 800km. I was outside watering plants on the south side of my home in Naperville IL. It was dark and I was talking to a neighbor who withessed this with me just above the horizon to our west traveling south to north arcing downward toward inpact. Our view was limited between two houses. It was quite bright and large. We both commented about seeing an extraterrestrial event. Just found this article to tell me we weren’t crazy. My kids and I was sitting outside and saw this last night in Golden City, Missouri south of K.C. At first I thouht it was a Airplane on fire, it was so low it seemed and I realized it wasn’t when it started breaking up. It was awesome to see. Saw the fire ball traveling between 3 and 4:00 in the eastern sky, going north. Quite speedy, very bright and then it broke into 4 pieces with the pieces disintegrating while the main fire ball continued on a bit more before disappearing. Observed via horseback from 2000 Rd and US 75 Hwy, Benedict, KS. I live in Branson,MO and was outside working in my garden late. It was between 8:30 and 8:45 that I looked up and saw something flash in the North. I thought it was a falling star because I guess I just caught the tail end of it. My kids and I saw this in Russellville, AR! I saw this in Park Hills, MO! I was sitting on my deck in Lee’s Summit, MO, looking the right direction at the right time and witnessed this meteor. I’ve seen many smaller ones. This one was by far the largest and most spectacular I’ve seen. I was very lucky. Saw it in Holts Summit as I was setting up my scope for the night. Me and my daughter saw it outside of Tipton, Iowa! It was amazing!!! I was on phone and staring at the night sky. Looking west at the urban glow of st Charles missou5 from golden eagle Illinois. It was way bigger than the planes that follow the Mississippi river south to the airport. I though to myself, goshthats a bright plane and its flying in the wrong direction. I wonder if anyone on the planes saw it? My husband and I were on our nightly dog walk in Smithville, MO Caught this bright light in my peripheral vision and looked up. My first thought was “who is setting of fireworks this time of year!” because it was so bright. The fireball traveled directly in front of us and broke into two pieces before burning out. So close, so bright, so cool! I saw the from Springfield Illinois. It looked greenish blue and seemed to go on for ever. I’m so happy I got to witness it! It appeared as if it was flying low and parallel to the earth at 8:40. Watching it break apart with such a long tail was amazing. I had a great view with no light pollution from Stronghurst, IL. It is wild to see how many witnesses there are! saw this high on top of the hill in gravois mills mo…on hwy 5.
kept thinking would hear it hit the ground..
what a site to see!!! got to wishes in!! Awesome! I saw meteor from Offutt AFB and shared it on Facebook. A woman in the local community said she saw it also. 🙂 So cool! I saw it 20-30 minutes ago. I told to myself: that is going too fast to be an airplane, plus it looked orage, like fire, and left no trails like human machines. I’m from Indiana Indianapolis, IN. People; the return of our LORD is very close; so far I observed there have been more than 5 fireballs this year. Mostly hit USA states. I was on my patio in Lebanon, TN and saw this beautiful green streak of light like a shooting star but 10 x more amazing!! We we’re fishing at White Bear Lake in Minnesota, it was pretty dark here then, we both looked up and thought it was just a shooting star, but then saw three different pieces break off. Not sure is it was the same one, but timing sounds right. Group of bicycle riders saw it at Pizza 51 at 51st and Oak. Very cool! So low in the sky I had to wonder it any of it made it to the ground. Saw the break up and flashes as it do so. I don’t think I ever saw something like this in my 53 yrs.